Hector Stuardo is the legendary Ovnimoon from Chile presenting his eleventh full length album! With many years of mastery now Hector can look deep within him and froma deep and hypnotic foundation present a truly epic concept that is important for everyone to understand. Each step in this 9 part experience performs a ritual function and empowers you during your active meditational dance. 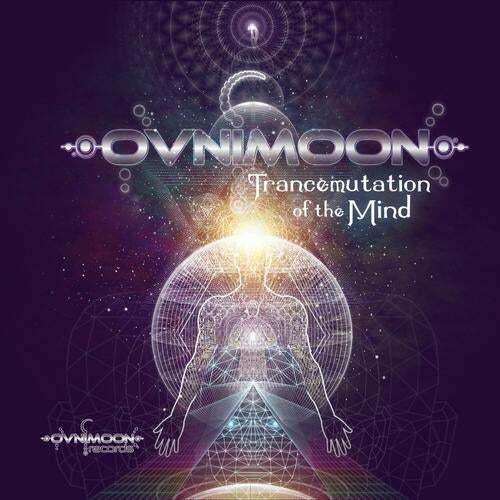 Trancemutation of the Mind is the follow up album after Magnetic Portal (released in 2011) from Ovnimoon. Hector finished this next level of production after a year where his musical output had been at a standstill. Trancemutation of the Mind is here to show a point of view about Psy and Trance music in our times, Hector feel's that nowadays too much of what is considered trance-music doesn't put the listener into a real trance state. This production is a reflection of his internal process, discovering how to transmute his mind and thoughts. The album has 9 groundbreaking tracks, each carrying a message with the objective to transmute the listeners mind as well. Good vibes and good energy is a message to the world that this album represents. Sam Farrand hand crafted a lavish 4 panel collectors art work with special liner notes. Tim Schuldt @ 4CN did extra special mastering for this. With massive support from the Ovnimoon and Geomagnetic Records teams and a lot of great producers like Lupin, Via Axis, Spirit Architect, Pragmatix, E-Mantra, Nova Fractal and Lyctum all helping out too. Hector Shares his personal thoughts here: "I had been trying to do music alone but with many friends cooperation the story was completed. I hope you enjoy this album, it is different, with subtle difference to Magnetic Portal and Geometric poetry to continue the mix of Psychedelic and progressive trance. Trancemutation of the Mind is simple and monotonous, I fell it's more hypnotic, repetitive, without much brakes. It helps to go in trance. I hope you get the essence and the messages and that they also help you, above all Hooponopono Track number 3 which is a ques es una terapia de autosanacion, y de ayuda al projimo. These are 4 words that you can repeat and they will cure you or someone that needs help. I feel that if I use this therapy on my album to help me and everyone "Help me and help you" is one of the basis of Transmutation of The Minds. I hope you enjoy, perceive and dance to it". "This album is dedicated to my personal, spiritual and emotional growth to overcome my limitations. The music reflects my personal journey, my time on earth, and my vision about trance music. A simple and subtle disc, with surprises and innovations that the listener may not expect, with interesting information and a hypnotic approach to remember the true, deeper origin of trance music. These songs contain lessons that I wish to learn in this lifetime and I share them to every listener to help with any challenges. Beating my limitations and fears will be transmuting my mind, in my time, at my own pace, and so it is, and so I will".